Discussion in 'Project Logs' started by voigts, 25 May 2009. Here is a list of links that will take you directly to the threads where I have posted pictures in case you want to skip straight to the pics. 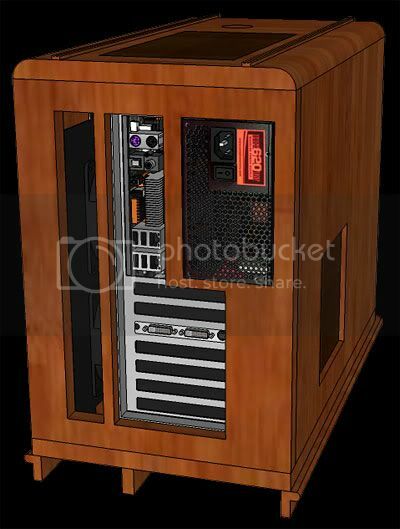 As I enjoy the design and building process, I find myself again working on another custom wood case design. 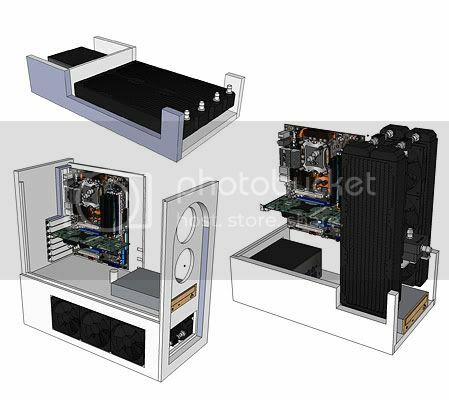 A few years ago, I became so disgruntled with cases not designed for watercooling that I decided to make my own case. Since I like to work with wood, this material was my natural choice. This case is my 4th custom case build. There was a time in particular during the early 20th century when for several decades there was an emphasis on aesthetic quality and workmanship in furniture made for the home. This extended to the central electronic device of the era, namely the radio. 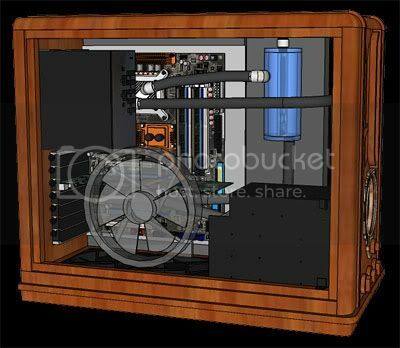 My last case I modeled after many of the furniture and architectural designs of the early 20th century with the idea of building a custom watercooled case that would have fit the time period had it been built then. For this build, I wanted to take things one step further by designing this case directly after a particular model of antique radio. Many radio collectors frequently collect radios built during the 1920s and 1930s because of their stylish appearances. I am not a radio collector in any way, but I do have an appreciation for the styling of many of these radios. 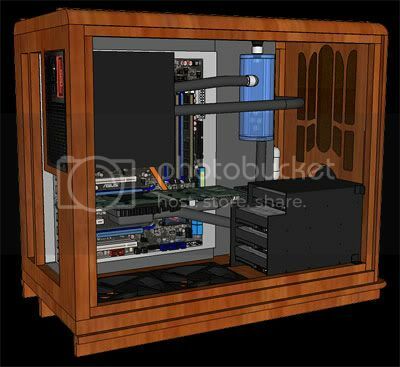 My plan is to build a performance minded system with a regular ATX MB with mid-sized tower dimensions. I want to reuse my current parts since they are only about 6 months old, and I currently don't want to spend the money yet on an I7 setup. I considered changing to a micro ATX MB, but given the proportions of the radios that I have researched, using a micro ATX MB offers me no real benefit as far as size goes. 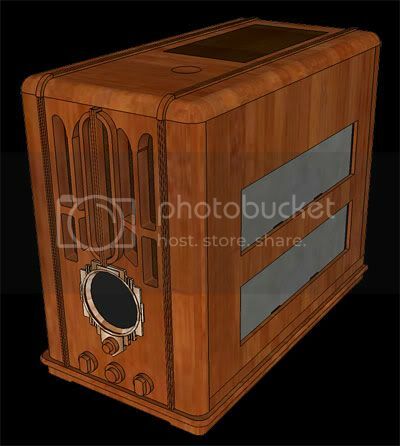 I spent a lot of time researching and looking around at literally hundreds of antique radio pictures online. 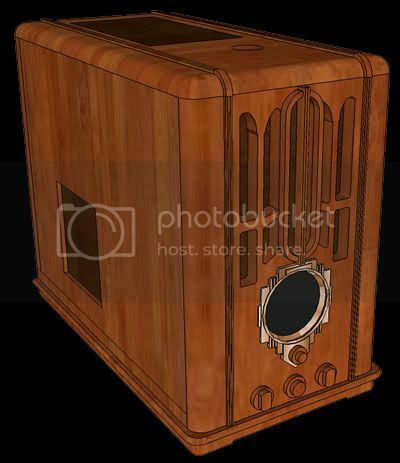 Many radios do not have a shape that can reasonably be replicated for use as a computer due to the space and placement constraints of components. 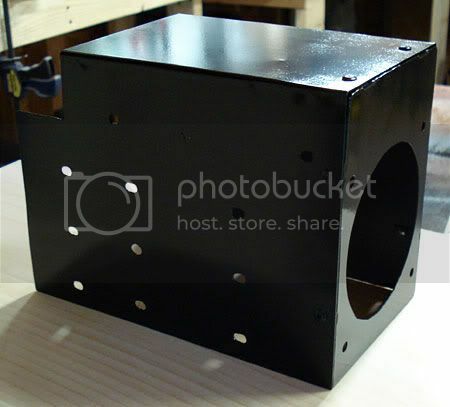 It is also necessary to find really good pictures of a radio in order to be able to build a case after it. 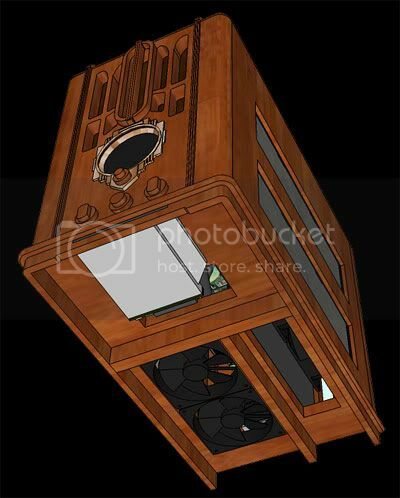 There are a number of radios that I could build after and like, but there simply aren't enough detailed photos of them to come up with a fairly accurate design. 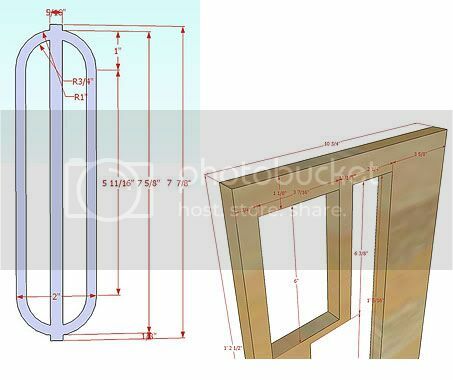 which have been posted on the Sketchup Components Collection website. 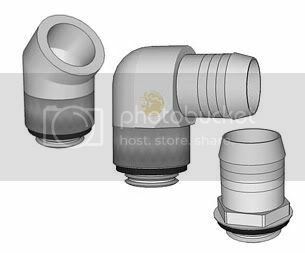 I was dealing a couple of pretty tight areas and wanted to have the fittings modeled to get an exact placement of components. I messed with every combination of placement using triple radiators I could think of. I prefer using dual triple rads as I like a system to be as quiet as possible as well as being future proof. I also wanted the dimensions of this build to be smaller than my current case due to the way that it fits inside of my desk. I spent a lot of time hashing out the placement of each component and the loop order of the setup down to every last detail I could think of. 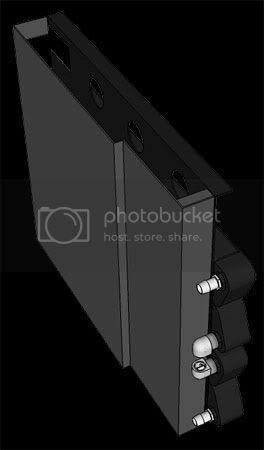 For example, I designed at least 5 different hard drive mounts alone. I do not like T-lines. 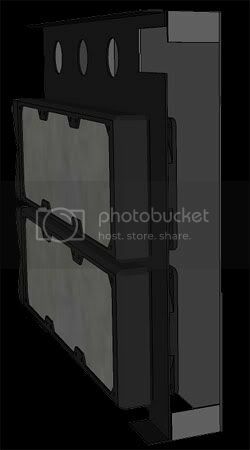 I designed and redesigned the res to make it easily accessible for filling with the pump directly beneath it for good water supply to the pump. I have never spent anywhere near the amount of time designing a setup as I have this one. 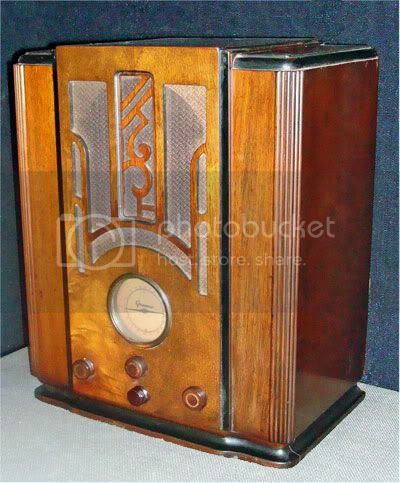 The first radio design that I settled on was a 1935 Grunow 650 Tombstone radio. The dimensions and size fit what I was looking for. 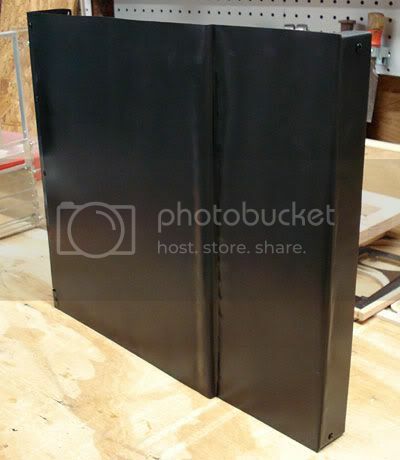 This model would require quite a bit of time and detailed routing due to the design. 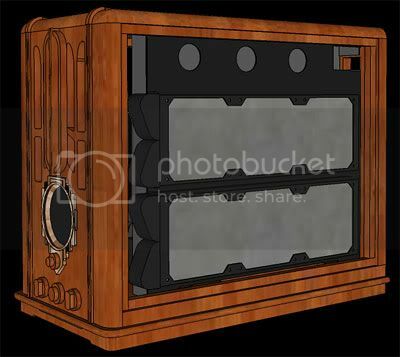 I completely modeled a design for this radio, and may build this in the future. However, in researching some more, I ran across the 1934-36 Zenith 5-S-29. 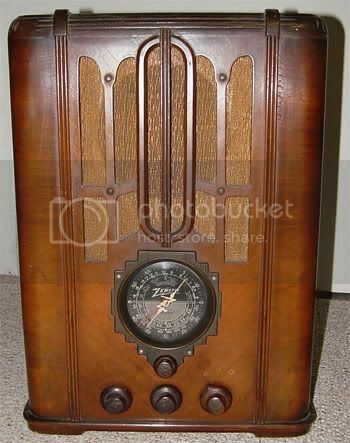 My daughter really likes the look of this radio (she likes the Grunow as well), which was one vote for sure in its favor, but I also found that I could get a replica radio dial, dial glass, escutcheon (dial bezel), and knobs for it. 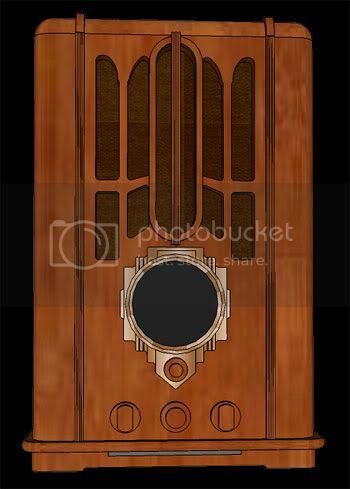 Since the Grunow wasn't as popular of a radio, parts are not available, so I drew the radio dial from a picture, would have to make my own knobs, and would have to make my own escutcheon (dial bezel). Buying the replica parts is costing me about $120, but it will add a very genuine look and feel to the case. My consultation team (wife and daughter) think that I should build them both, and I am entertaining the idea in the back of my mind. For the moment however I am just working on the Zenith design. Sketchup is such a wonderful tool for projects like this. 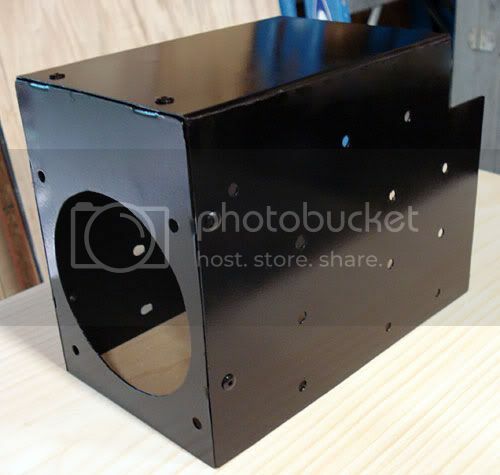 Every part can be placed to scale, exactly measured, and dimensions drawn and printed. I export full dimension views, resize them in Photoshop, and print them out. This gives me working blueprints to build from. I had a brainstorm yesterday about how the airflow for the rads will go. 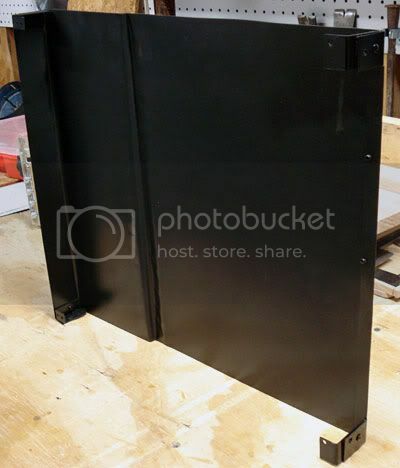 I made some changes to my original design and am going to make a metal divider that the MB tray will mount to so that the rads will pull in ourside air and vent it out of the top and back. 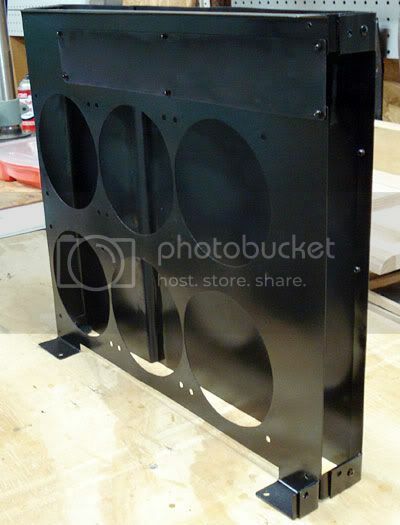 This way the rads get fresh air, and the rad air will be isolated from the case airflow. Two weeks ago I started cutting out the pieces for the Zenith. I am using all Oak for the case. Oak is such a wonderful wood to work with. Having built other cases first out of Pine and more recently out of Poplar, I find the Oak to be the best to work with. I drew the front grill cutout on the front piece, and spent several hours sanding and cleaning up the cutout areas. This is what you get for being picky. 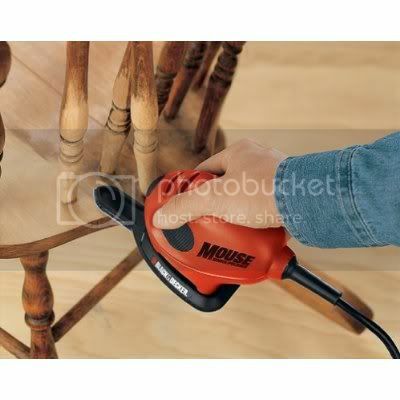 A dremel and a mouse sander are my friends here. This is the attachment that has been my best friend. 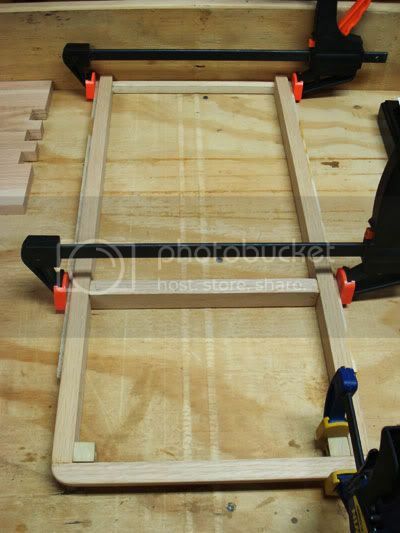 I allows me to sand all of the sides of anywhere that I cut out, which otherwise would be very hard to do. I also cut out the other pieces using a scrollsaw. 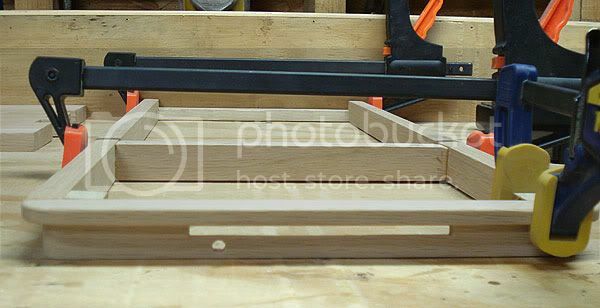 A scrollsaw works much better than trying to use a jigsaw as jigsaw blades bend and make for angled cuts whereas the scrollsaw holds both ends of the blade. I made a mount for the PSU out of 1/8” smoked brown acrylic as well as mount for the bottom fans. When I made the radiator mount a week ago, it was a real pain in the neck. My plan is to use 18 gauge sheet metal, but my hole saw bit didn't want to cut through it. It must not be bi-metal. I ordered a new bi-metal bit off of Ebay, but didn't want to wait on it to come in before building this. I worked on a mount using 1/8” acrylic, but it just wasn't sturdy enough for me. 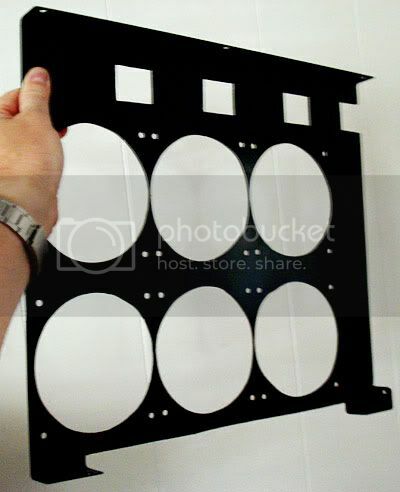 So I went back with a jigsaw and hand cut all of the fan holes. I don't plan on doing that again. It worked well enough, but having bits of hot metal beat you in the arms is no fun. 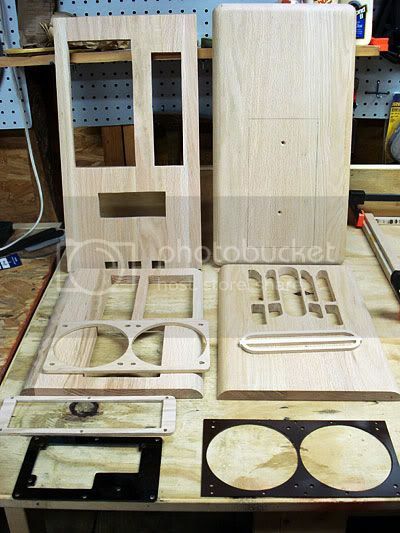 Here is a pic of all of the parts that I have cutout. I am almost done cutting them out. I still have to cut out for the escutcheon and knobs in the front and the air vent in the top. 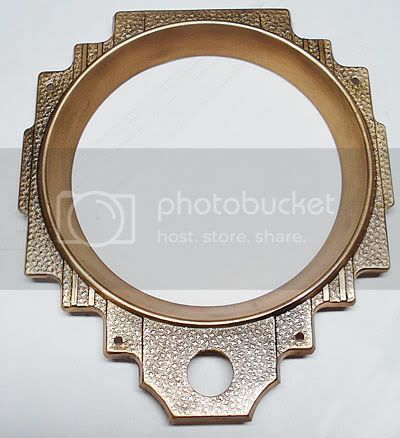 I ordered the replica knobs, escutcheon (brass bezel for the dial), replica dial, grill cloth, and glass dial cover. The guy at the antique shop I ordered from goofed up my order twice, so I am waiting still for one of the knobs which I won't get in until next week. The escutcheon was painted with some nasty yellowish paint. I should have taken a before picture of this. It looked really nasty. Go figure why anyone would take brass and paint it! I stripped it a couple of days ago, got all of the tarnish off, buffed it with a dremel, and gave it 3 coats of spray laquer to keep it from tarnishing. Here is the result. I started assembling the base trim pieces. 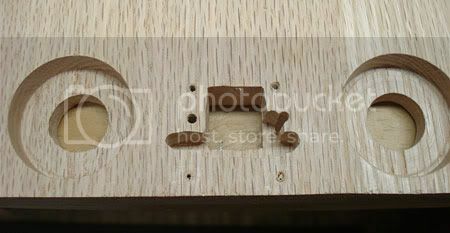 I cut and used dowel rods on the middle support piece, and glued and screwed in two corner pieces for the front to side connections. For the DVD, the way I modeled it is to have a slot loading DVD just under the trim lip. I cut out the slot for the drive, and used my Black and Decker Dremel clone to cut out an inset on the backside where the DVD sits so that will be only 3/16" from the front edge. Next I plan on cutting out the hole and an inset for the escutcheon, dial, and dial glass, and I have to cut out the hole in the top for the air vent as well as in the back piece. Wow, this is rather impressive. I await more! Looks great so far,sub'd,like you say,oak's great to work with when it's green but once it's seasoned it's like working with iron. 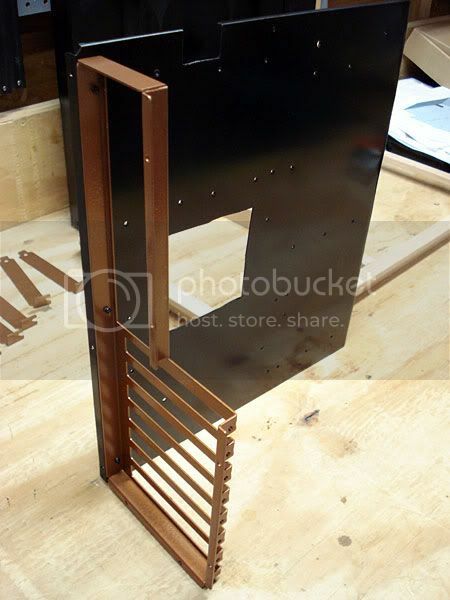 Can't wait to see how you build the wooden radiators and tubing. Now there's an idea. Hmmm, I wonder whether pine, oak, or poplar would be the best at dissipating heat? You could grow bamboo- trained "bonsai" style, naturally (see what I did there? )- to make the formed tubing. As for the radiators...you got me. This is a lovely project. I like that you are replicating an antique instead of modifying one. 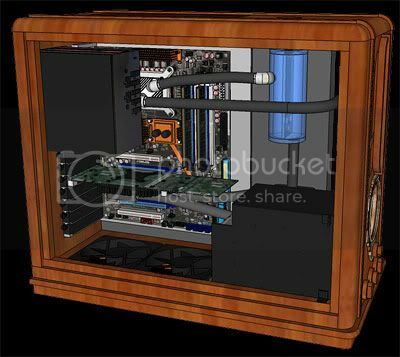 Have you thought of making the front bezel into a reservoir? Good design choice. In my mind, the Zenith (with all it's rounded edges) looks so much better than the Grunow. Will be keeping an eye on this thread. 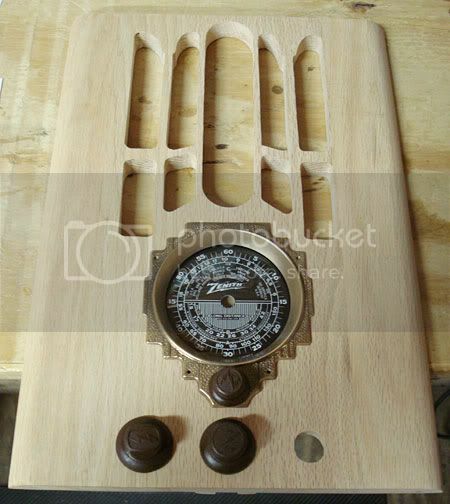 That idea hadn't even crossed my mind as one of the things that appealed to me about this radio in particular is that I was able to get a real escutcheon, replica dial, replica dial glass, and replica knobs. I am trying to get the outside as close to the original as I realistically can. I got the holes cut for the dial bezel, dial, and glass today. I plan on getting the other air holes cut out tomorrow and hopefully work on the radiator air chamber. Nice project, and a very good start. I will follow your log. Time for an update. I have been steadily working away at this for anywhere from 4-6 hours or so in the mornings after getting home from work (night shift). I am very pleased so far with how this is turning out in relation to my Sketchup models and plan. I wanted an easy way to mount the dial and dial glass. The dial and glass are 3 7/8” dia. The inside circle of the escutcheon is 3 3/8”. So I came up with the hole in a hole idea. The one problem was how to cut this. The only rabbit bit that I have is a 3/8” depth cutting bit. So what I did was to first cut out with my scrollsaw a 3 1/8” hole. I then used the router with rabbit bit to cut out the 3 7/8” hole 3/8' deep, which is the depth of the escutcheon, dial, and dial glass. 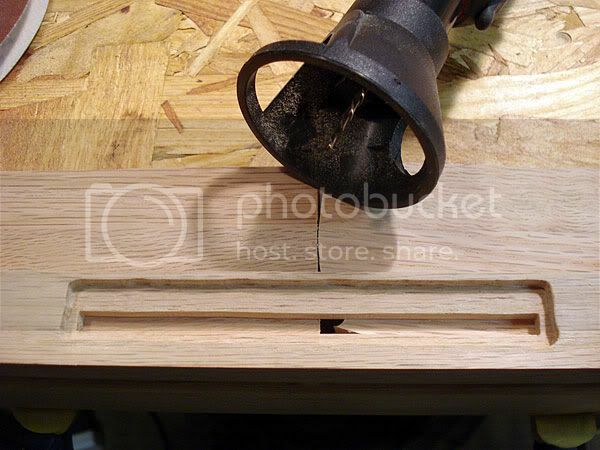 I then recut the 3 1/8” hole to be 3 3/8” with the scrollsaw. This way, the dial and dial glass just set down inside of the hole under the escutcheon. I'll probably put a piece of clear acrylic behind the hole to mount LEDs into, and to mount a fake radio needles which I have yet to make. 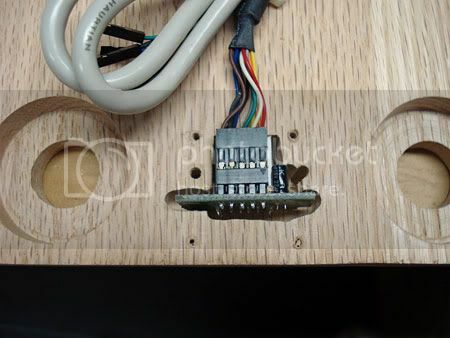 A power switch is also in place so you can see where it goes. Here is a pic with the escutcheon, dial, dial glass, and 3 of the knobs placed where they will go. 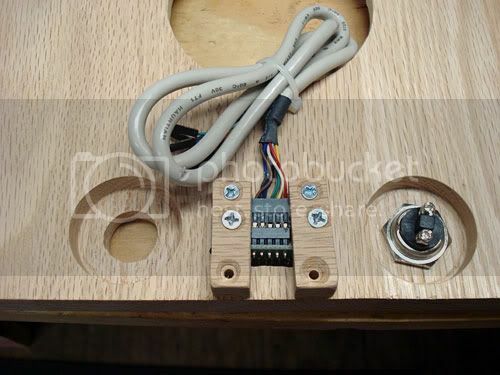 I am still waiting on the 4th knob from the guy who messed up my order. I bought a USB/Firewire card from Directron. Not wanting or needing the firewire, I dremeled out the solder leads and cut off the part of the card with the firewire jack. I cut the initial 5/8' square hole with the scrollsaw, and then used the Dremel to ream out the area to be cut out for the card to fit flush with the front. I also cut notches in two small pieces of wood to hold the card in place. I finished the mount for the hard drives. 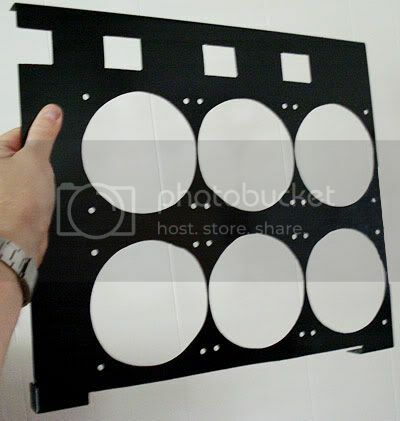 I made a template from clear acrylic to mark the holes for the hard drive screws onto the metal. 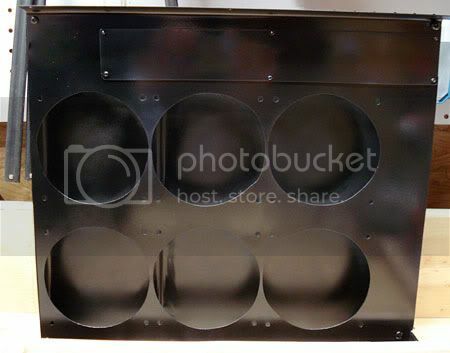 The back piece for the 92mm fan has tabs that I riveted into the sides and top to hold everything in place. This piece took me the better part of one morning. 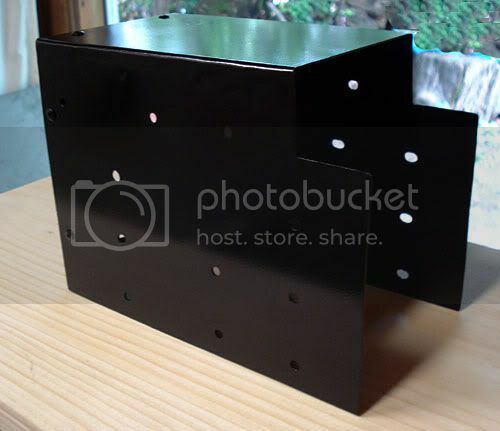 I don't have a metal brake so I'm bending everything by hand with clamps and a metal L square with the help of a hammer. I trimmed the MB tray that I got from Performance-Pcs. The L shape on the edges was 1/4”, but I didn't want that much, so I cut the edges down to < 1/8”. I also cut out under the CPU area for a bit of airflow. I painted the back panel in hammered copper along with the PCI slot covers, and riveted it back together. I spent a good bit of time messing with this shroud. Since it wasn't originally a part of the design as I added it only a few days ago, I hadn't really thought through the tabs I would need on the rads mount to attach to the shroud. So I had to cut and rivet tabs to the rads mount so that the shroud and rads mount screw together easily for stability, but also so that the rads mount can easily be removed if needed. I also had to mount a piece to cover what were going to be wiring holes in the rad mounts piece because if I left them, then air would shoot back into the case. Bending the air shroud by hand was a real pain. I got a piece of 18 gauge aluminum for this. The hard part was getting the 3/8” bend in the middle to allow room for the pump to mount between the shroud and the hard drives mount. I will have a bending brake if I do this again! Next on the list are the dial needles which I think I'm going to cut out of acrylic and paint, and the reservoir. Then I plan on starting drilling the dowel rod holes and gluing her together. I may also still thin out the area behind the front grill to be only 3/8” thick instead of the current full 3/4” thick as I think that will look more original. I also have to decide on the stain color, which currently I think is going to be walnut. I should probably post more detail of exactly how I'm doing everything, but I find myself wrapped up in getting things done and before I know it, I've got something completed before I take pics. This weekend we are going camping, so more will be coming next week sometime. its so cleanly done... i really like it.! -Sorry about my suggestion. I didn't know you had the gage. Next on the list are the dial needles which I think I'm going to cut out of acrylic and paint, and the reservoir. Have you a pic of the original dial needle(s?) and what size they are? 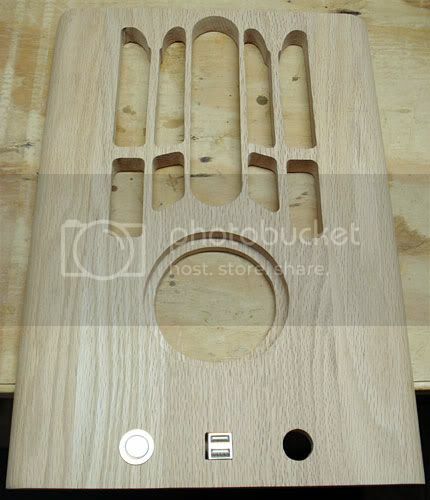 Nice job on the oak front panel,was it cnc'd or did you rout it by hand. Are you familiar with the works of slippery skip?